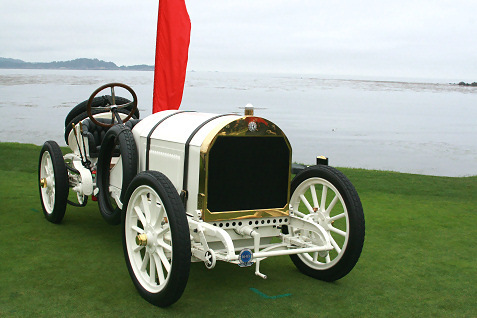 We were back at Pebble Beach this year for the 2013 Concours D’Elegance at Pebble Beach, and again we had the opportunity to participate in the Dawn Patrol as the owners of the amazing classic cars drove them onto the 18th hole at Pebble Beach just as the sun was rising. We saw a stunning variety of beautiful vehicles as the drove past us during the dawn Patrol and then on the fairway at Pebble as they were on display for everyone to see. The Best of Show award went to the owners of a 1934 Packard as cars from this time period often take the top prize. 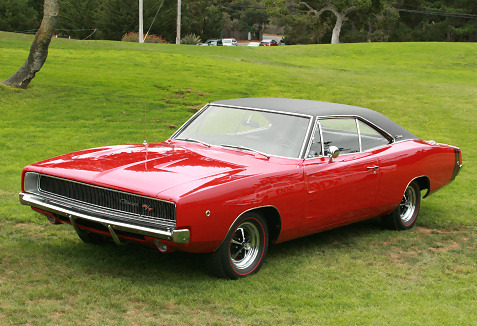 Those cars are beautiful, of course, but we’re usually most interested in the classic post-war sports cars. 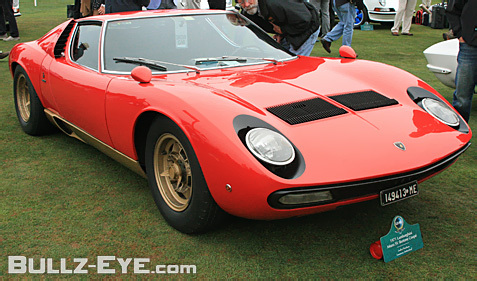 This year the Lamborghinis grabbed our attention as it was one of the featured brands as it celebrated its 50th anniversary. 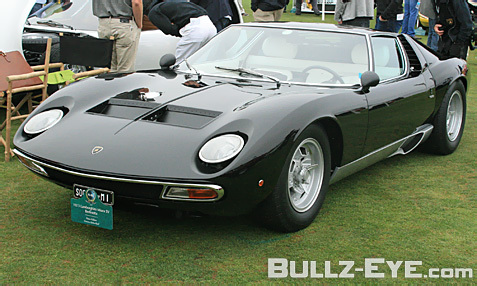 We certainly appreciate the modern Lambos as we’ve featured the new Aventador and drove the Gallardo on a track, so it was a treat to see some of the classic models up close. 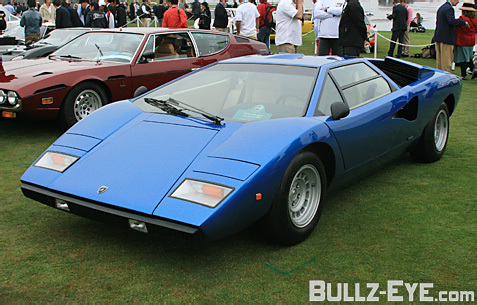 The 1976 Lamborghini Countach LP400 in particular stood out with its bright blue paint job as you can see in the slideshow above. 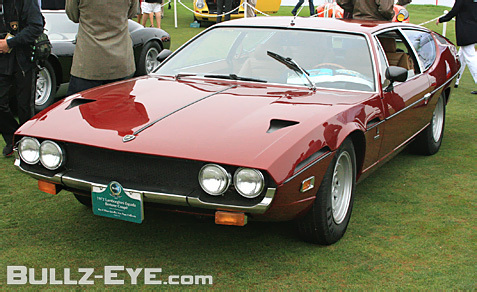 It’s hard to compete with the elegant sports cars from the 1960s, but the Countach offered up a radical design in the 1970s with its wedge-shaped, sharply angled look that had a huge impact on sports car design for a generation. You can also see how the cab-forward design of the Countach offered a dramatic contrast to the longer front hoods of the sports cars from the 60s. We made sure to get some photos with the iconic scissor doors opened up as well. 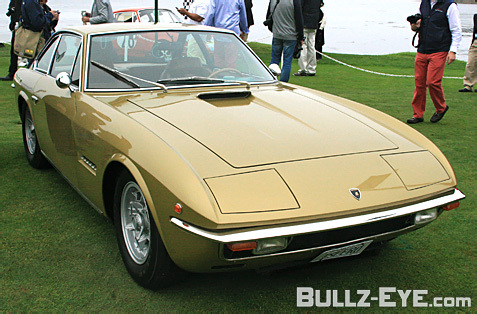 You can see the evolution of the Lamborghini designs through the 60s into the 70s and also why these cars caught our eye. We’ll be posting more photos from Pebble Beach here and on our car site Dashboard News, but kicking things off with the Lamborghinis seemed like the obvious choice. I was on hand last Thursday evening as Cadillac unveiled the new Elmiraj Concept at Tehàma Golf Club in beautiful hills of Carmel, California. The setting was perfect for the introduction of this coupe concept car which gives us an exciting preview of Cadillac’s future. As you can see from the photos I took in the slideshow above, the Elmiraj is a beautiful vehicle that boldly moves Cadillac forward while also drawing inspiration from the iconic large coupes from its past. The design of the vehicle grabs your attention from every angle, and the Elmiraj looks unlike anything you’ll find on the road today. The long wheelbase and the long dash-to-axle front profile give it a distinctive Cadillac look. I was very happy to see the large, vertical headlights that we first saw in the Ciel concept along with the vertical taillights as well. The Elmiraj also introduced a new Cadillac badge in the front grille with the iconic wreath removed. 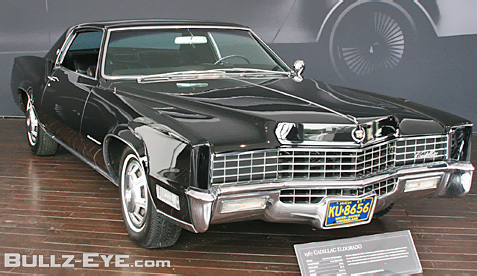 Cadillac describes the Elmiraj as a “modern update to the classic format of a two-door grand coupe.” In a prepared statement, Clay Dean, executive director of advanced design, explained, “We were influenced in particular by the 1967 Eldorado, both its actual design and the fact that in its time that car was a very stark contrast and a new direction.” Cadillac included one of these classic Eldorados in its display for the Elmiraj at the Concours d’Elegance at Pebble Beach. Cadillac has been making an impression on consumers as sales are up 30% this year. We’re not surprised as we’ve been very impressed with Cadillac lately, as you’ll see in our upcoming review of the 2013 Cadillac ATS 3.6L Premium. Cadillac’s designers deserve credit along with the commitment to rear-wheel drive performance luxury vehicles. With Elmiraj we’re seeing the brand continue that commitment. Elmiraj sports a 4.5-liter twin turbocharged V8 delivering an estimated 500 horsepower. We’ll see what exactly ends up in a production version of this vehicle, but Cadillac is making a statement by equipping the Elmiraj with a powerful engine like this. Elmiraj also sports 22-x-9-in. aluminum wheels along with large ceramic brakes with Cadillac monoblock calipers. It’s refreshing to see an iconic brand like Cadillac draw inspiration from its past with a completely modern take. A grand coupe inspired by the Elmiraj would be a fantastic addition to Cadillac’s lineup. 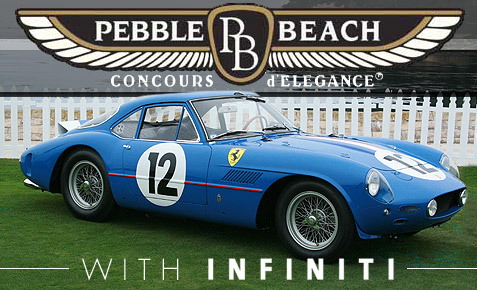 I’ve seen tons of beautiful cars, old and new, this weekend at the Pebble Beach Concours d’Elegance. 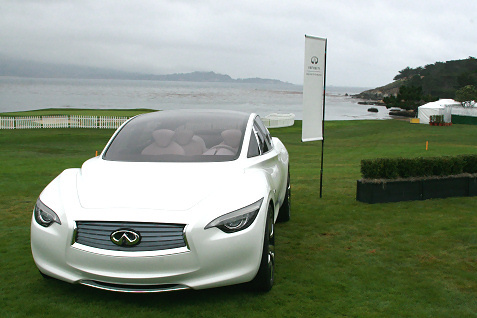 It’s an amazing celebration of the automobile, and this morning we found ourselves on the 18th hole at Pebble Beach as Infiniti introduced its Etherea Concept for the first time in North America. It was a little cloudy and chilly as you can see from the photos, but the view was spectacular. Tomorrow morning we’ll be back for the Concours as some amazing classic automobiles will be on display on the same spot. The Etherea Concept is very impressive and is worthy of such a prestigious location for its introduction. I love the lines on this car, and the suicide doors punctuate the bold design. It’s clear from this vehicle and the JX Concept introduced yesterday that Infiniti will continue to be aggressive in its styling. The Etherea is an “exploration” of a future model so it will be interesting to see the final product, but they’re definitely headed in the right direction. 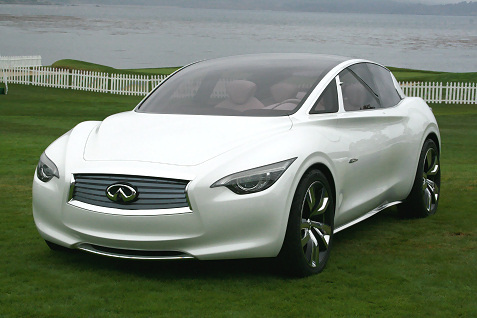 You can learn more about the Etherea Concept and the JX Concept at the Infiniti Facebook page.